There’s nothing like a Delhi to Goa tour to let loose the senses on an unbridled journey past some of India’s most magnificent monuments and naturally exhilarating landscapes with Agra, Pushkar and Mumbai all to be found as you travel overland prior to flying onwards to Goa. Budget-conscious travellers have always loved life on the Indian railways and as this Delhi to Goa tour features several train journeys you can rest assured that the romance of this former hippy trail is still alive, well and waiting for you to clamber aboard. This fantastic two week itinerary crosses the largest state in India, Rajasthan, with everything from the Taj Mahal and the Amber Fort to Savitri Temple and one of Gandhi’s former residences, Gandhi Ashram at Sabarmati, offering ample experiences incorporated within Delhi to Goa tours. 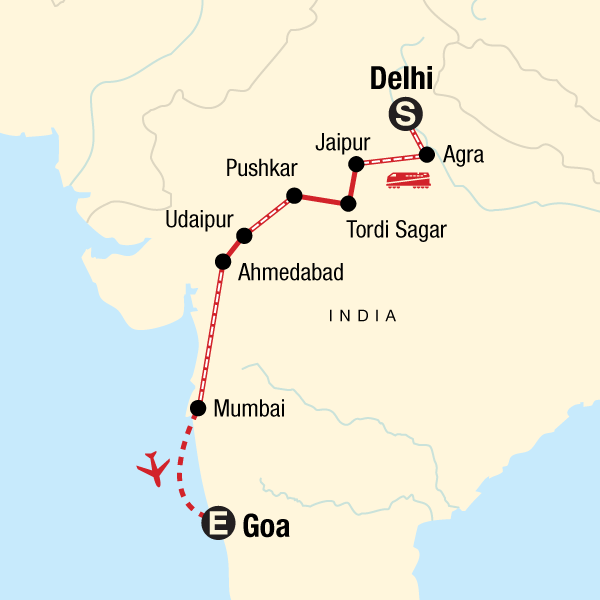 Our expert tour guides have created this fast-paced trip with the budget traveller in mind with plenty of free time to explore matched with overnight train travel to help you discover India on a Delhi to Goa tour that suits both your style and your bank balance. This trip is aimed at 18-30 age groups so, if you are of the real hippy generation, it will certainly keep you young. But it might not be for everyone. Small group. 4-18 adults. Min age. 18. Solo travellers welcome. Surcharge for single rooms if available. Basic hotels, sleeper train, internal flight, most activities, guide, local public transport. 1 breakfast, 1 lunch, 2 dinners included. Budget £180-£250 for others. Accommodation: The majority of our hotels are small, locally owned and family operated establishments. This tour includes twelve nights in hotels and guesthouses and one night on a sleeper train. Local guides and operators: By working with local guides and operators, we provide economic benefits directly to the local people and businesses. Our local guides are experts in flora, fauna, and history and culture, and provide our travellers with insight into local knowledge. Through this, we support the Seva Canada Society, an international non-governmental organization dedicated to the elimination of preventable and treatable blindness. Seva has worked in Nepal and India for 25 years and more recently in Tibet and Tanzania. Today, nearly 40 million people are blind with ninety percent of the world’s blind living in developing countries. Another 135 million have debilitating low vision. The good news is that most of this blindness can be prevented or cured. Half of the world’s blindness is caused by cataract that is reversible with a 15-minute operation costing US $20 - US $50 in most developing countries. Absolutely, we travelled using local transport always, reducing our carbon footprint and locals were always employed to drive us, guide us etc. We ate in good but local places and one night in a social enterprise set up to support lower caste Indians and street Indian into employment. I noticed other reviewers commenting on plastic (you buy 1l bottle water for 20-40p each 4-6times a day and it is rare to be able to throw them in recycling), this is of course frustrating but I don't really see what the travel company can do about it, they are doing what they can where they can, they cant transform a countries recycling processes and attitudes overnight! Discovering and exploring new places, meeting people, getting to know a new culture and way of life. I felt the trip covered a lot of aspects such as the history, culture, food, people, traditions and more. Our days were filled with the right amount of activities as well as unexpected events. We visited Forts, palaces, Ashrams, holy lakes, invited to an Indian wedding, went to a music festival in Goa and got to do it all with a great group of people. Our local guide definitely made all the difference for this trip and made it easier for us to get to know India and didn’t get hassled as much as we could have done. He also went out of his way if we needed or requested something and made sure we had fun along the way as well. Just go with the flow of the trip. The guide is always on hand to answer questions. Do the activities, try to catch a sunrise it’s worth it and sunsets are always special there. Go with a very open mind and don’t have high expectations especially when it comes to local transportation and you will be pleasantly surprised along the way.